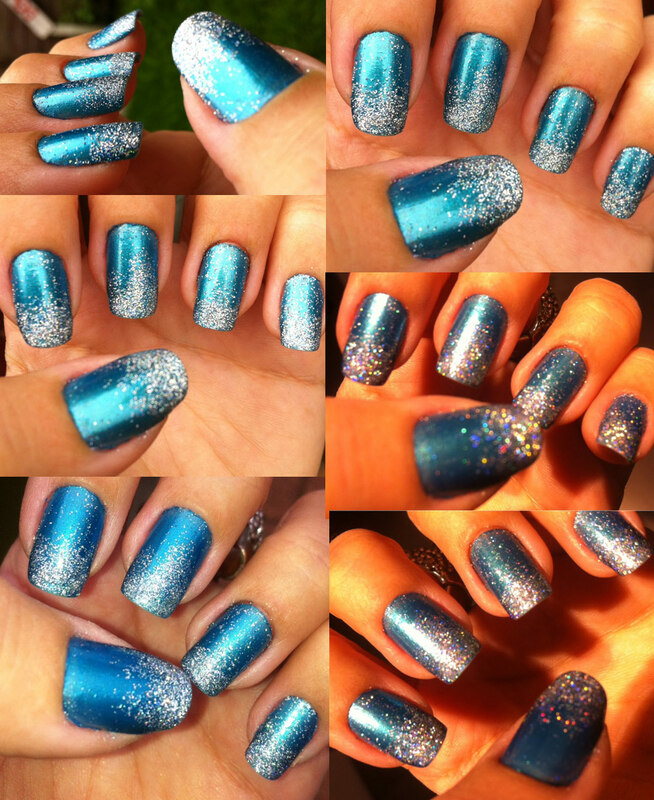 I had spotted Andrea Fullerton’s Georgia Glitter Duo, a pretty set with two glitter puff dusts and a topcoat, a while back but for some reason, forgot about it. What I really liked was the holographic sheen on the gold and silver glitters that came in the set. So we met again, and I decided to take it, at £6.99 from Superdrug. I had been dying to try this new Ana Hickmann blue nail polish, Rock, which I bought recently, and thought the blue glitter, fading from the tip to the middle of the nail would look fab. And it does – like a mini winter wonderland! Application of the polish was good, it is quite sheer, more than I expected, but it is good enough on two coats. The puffs are easy enough to use, although I think I need a small brush to even it out a bit; I did it with my fingers, and was very worried about ruining the polish. Obviously, they are not all the same, and that bothers me a bit, but I am sure that I will improve with practice. Durability was kind of alright; the glitter rubbed off from my thumb, indicator and middle finger; but I gave it a re-touch five days after doing the manicure, so not too bad. have to say it wasn’t very easy to remove, as expected from glitter! Still, I cannot wait to use the gold one! You can get a set with five glitter puffs,in varied colours from eBay too, for only £5.